Bill Rudd at the Lemnos Gallipoli Memorial in Albert Park. Photo: Jim Claven. Last week, Anzac veteran and former POW Bill Rudd visited the Lemnos Gallipoli Memorial in Melbourne’s Albert Park in the company of Jim Claven, secretary of the Lemnos Gallipoli Commemorative Committee. Bill expressed his admiration for the work of the committee and all involved in creating this memorial to a forgotten part of Greece’s link to Australia’s Anzac tradition. 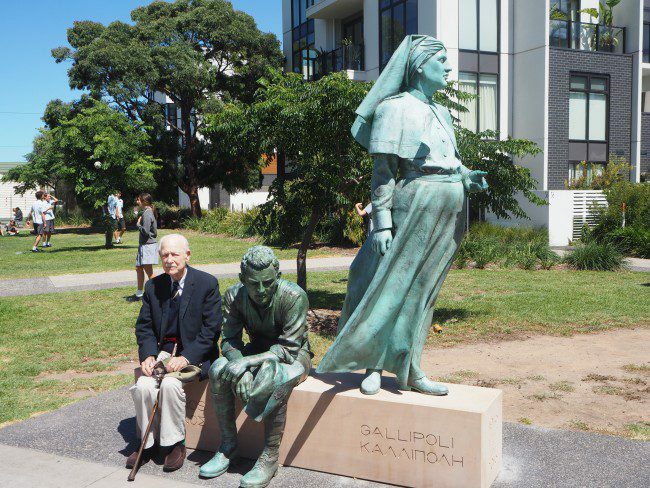 “As a veteran myself with a link to Greece in World War II, I very much appreciate the creation of this wonderful memorial to Australia’s nurses and soldiers who served on Lemnos in World War I. Memorials such as this create an enduring link to Australia’s Anzac past and to its links to Greece,” he said. He particularly admired the work of the sculptor of the memorial, Peter Corlett, OAM. Bill was eager to see the memorial as he had recently attended the unveiling of another Peter Corlett memorial in Ballarat. Titled The Grieving Mother, this sculpture is dedicated to all mothers who suffered as a result of losing their sons in war. Members of the Lemnos Gallipoli Commemorative Committee −Christina Despoteris, John Salpigtidis, Lambis Englezos, George Petrou and Jim Claven − also attended this unveiling. Bill, who recently celebrated his 99th birthday, served in the Middle East in the Second World War and was captured during the great battle of El Alamein. While sailing to Italy aboard an Italian POW transport ship − the Nino Bixio, Bill and the Allied POWs on board were landed at Pylos following the torpedoing of the ship in the sea nearby in August 1942. After a period of incarceration at Pylos, Bill was transported up through Greece to Patras and eventually transported to Italy, where he was placed in an Italian POW camp. Bill later escaped to freedom in Switzerland. He fondly remembers the kindness of the local Greek community at Pylos, who braved retribution from the Italian guards by bringing figs and tomatoes to the surviving POWs that landed at Pylos. Mr Claven said it was a pleasure to take Bill to the Lemnos Gallipoli Memorial. Jim pointed out that his website includes vital information regarding Allied soldiers on the run in Greece throughout WW2. The website is now part of the Australian War Memorial’s resource base.